On March 10th, Senior Alex Kerr demonstrates her defensive presence in a game against Hazelwood Central. Senior Alex Kerr has big things coming her way. Next year, she heads to Missouri S&T to further her academic and basketball career. Though she graduates soon, Alex leaves behind a great high school basketball career for herself and St. Joe. 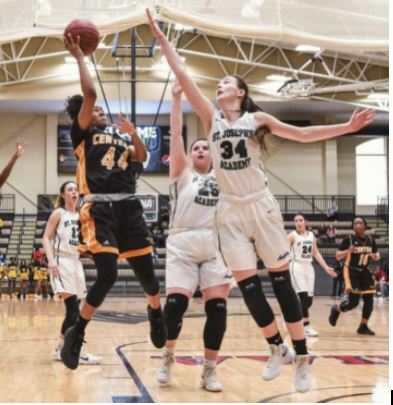 Kerr had the honor of being selected to the Missouri Basketball Coaches Association’s Class 5 All-State Team, which recognizes the top twenty players in the state. She also was selected for the Class 5 All-Academic Team, along with seniors Mary LaBelle and Anna Welch. Only two other seniors were nominated for both awards, like Alex. Alex has been playing basketball since Kindergarten, when she first fell in love with the sport. Teammate Mary LaBelle loves playing with Alex. Alex has shown great passion and drive at St. Joe. On and off the court, she exemplifies respectfulness and sportsmanship with her team, coach, referees, and opponents. Missouri S&T is lucky to have such a star player. Alex, herself, is grateful for the opportunity. “I enjoy playing this sport so much, I don’t know what I would do if I could not play,” Alex said. The St. Joe community wishes her well in all you accomplish in the future.